This large tote is ideal for carrying your personal items on a weekend getaway, an outdoor concert,or out shopping! Bag is made of cotton canvas and lined in contrasting beige cotton canvas, with inside pockets & magnetic snap closure. Inside pockets extend across the interior of the bag. 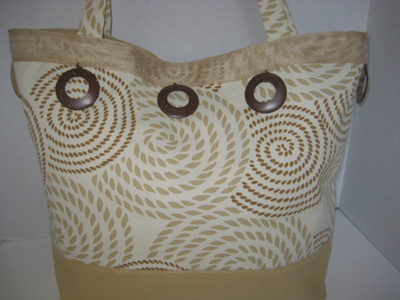 Wooden circles, along with a natural fiber trim are used to embellish the outer edge of the bag.